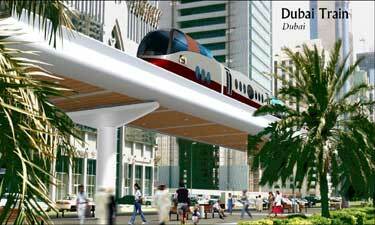 The Dubai Metro System will be built around top-of-the-class modern trains, fully air-conditioned and customized to meet Dubai specific requirements. Each train will be approximately 75m long, consisting of 5 cars, with numerous double doors allowing fast and smooth flows of passengers in station. The trains will offer a standard class, affordable to all, a women and children only section as well as an exclusive 1st Class section. All sections will have a high proportion of seats, and be equipped with a state-of-the-art Passenger Information System. The trains will be driverless, fully automated, offering an extremely safe and reliable service with trains which could run as often as one every minute and a half, with extensive window panels providing stunning views from the elevated sections over the cityscape. The trains will be fast and will run on tracks, while the electrical traction system is environmentally friendly, in terms of noise and with no gas emissions. No visually intrusive overhead contact lines will be needed, thanks to the "3rd rail" collection system. The trains will use steel wheels or tires (to be defined later) running on a special double track for full guidance and support. All station will be equipped with Platform Screen Doors, ensuring optimal safety for passengers and allowing to fully air-condition all stations, whether elevated or underground. The Red Line will initially (Initial Operation Segment) run from Salahuddin Rd (close to Al Ghurair Centre) to the American University of Dubai through Burjuman and Sheikh Zayed Rd, and will progressively be extended to Jebel Ali Port in the south and the intersection of Al Nahda and Damascus roads through Al Qiyadah intersection in the north. The Green Line will initially (Initial Operation Segment) run from Al Ittihad Square (close to the Municipality) to Rashidiya bus station through Deira City Centre and the Airport Terminals 1 and 3, and will progressively be extended to serve the Deira and Bur Dubai central areas and Souks up to Burjuman and Wafi shopping centers. The two lines will total nearly 70 km, with 35 stations along the 50-km long Red Line, and 22 along the 20-km long Green Line. The two transfer stations at Al Ittihad Square and Burjuman are common to both lines. 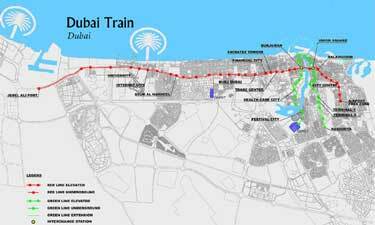 A possible extension of the Green Line from Wafi to the projected Festival City development is under study. Red Line from the intersection of Sheikh Rashid and Sheikh Khalifa Bin Zayed roads to just before the intersection of Salahuddin and Abu Bakr Al Siddique roads. Green Line from Garhoud to Oud Metha Rd. The two lines will run elevated on a specially designed viaduct everywhere else. The viaduct design and aesthetics is being developed specifically to actually enhance the urban architecture along its corridor. In no location will the tracks cross the public highway, ensuring fully safe mode segregation. The 3D renderings developed during Preliminary Engineering give a first idea of how the Metro System will fit nicely within Dubai urban setting. However, the train, as represented, does not reflect how it will look as the manufacturer has not yet been selected. In total, the Metro System will include 55 stations, 18 km of tunnels, 51 km of viaduct, one major train depot and maintenance facilities site and several auxiliary stabling facilities. The total fleet size will be slightly in excess of 100 trains.